Hi to this community ! Nice to meet you guys ! First of all thanks for your Channel ! - cx4.jpg : Are the number correct ?? 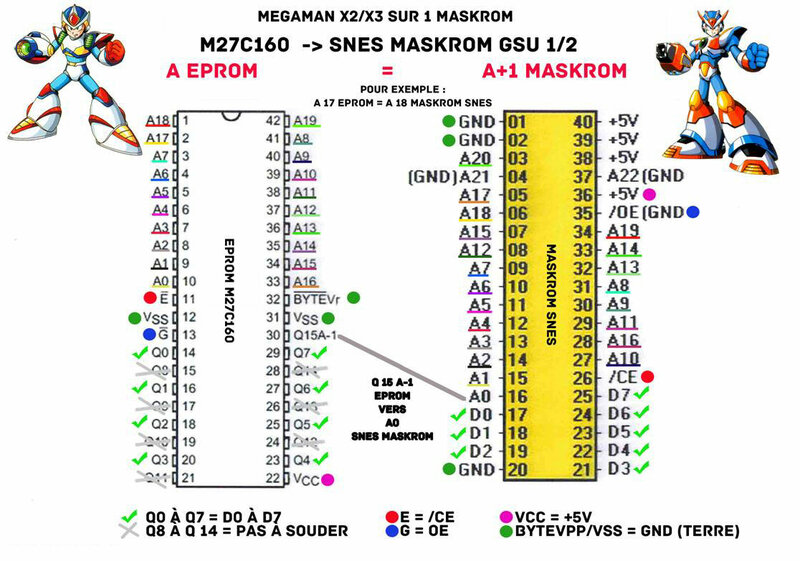 Because they told me i have to connect two pins after that, but i want to be sure the numbers are in the good places..
- SHVC-ARXJ-JPN.jpg : I want to Replace those two maskroms with 1x 27C160. Yes, the silkscreened numbers are correct. Nocash has a pinout here. The CX4 controls at run-time whether it addresses one 2 MiB ROM or two 1 MiB ROMs. We just had a thread about this here. The actual literal contents of the ROM control whether the cart can address two 1 MiB ROMs or one 2 MiB ROM. 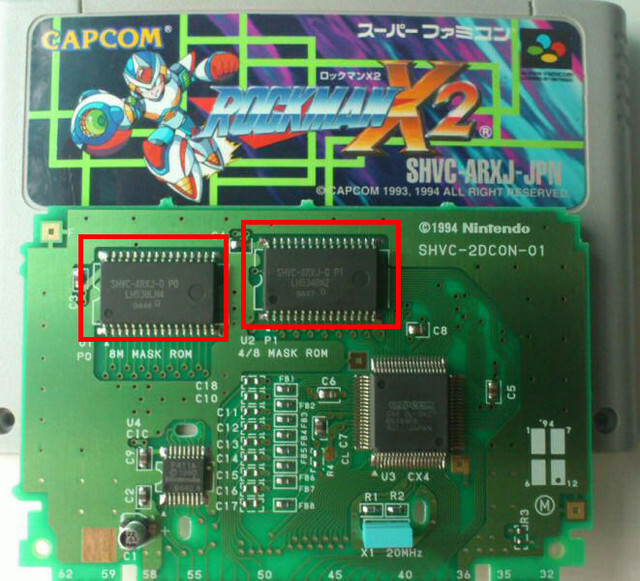 MMX2, 1.5MiB, always was on 2 ROMs. MMX3, 2 MiB, was always on 1 ROM. The program data in MMX3 configures the CX4 to address one 2 MiB ROM. The data in MMX2 configures the CX4 to address two 1 MiB ROMs. On the 2DC0N board, the left one (labeled U1) is the "first" one. Both ROMs are connected completely in parallel, EXCEPT that they each have their own chip enable pin. I really understand that. But do you agree when i say its possible to use 1 x 27C160 on the PCB of MMX 2 ? Sounds interesting ! So i can put my 27C160 in parallele to the 2 maskrom on MMX2 and it will works ? What Schem do i have to follow ? A ROM is just a ROM. However, the specific connections matter. The CX4 can only address a byte-wide ROM. The 27C160 has to be configured accordingly. The pin order between the that UVEPROM and the original mask ROM differs dramatically. Sounds interesting ! So i can put my 27C160 in parallel to the 2 maskrom on MMX2 and it will works ? Yes, but you have to disable the existing ROMs in order to prevent a bus conflict. 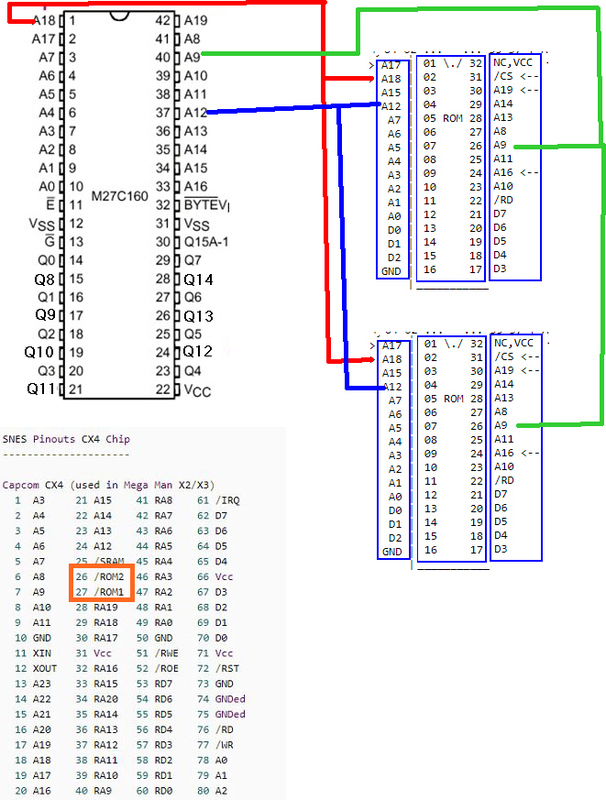 Use the pinout of the CX4, the existing ROMs, and that of the M27C160. Because the 27C160 uses word addresses, you need to connect its A-1 to CX4 A0, 27C160 A0 to CX4 A1, and so on up. 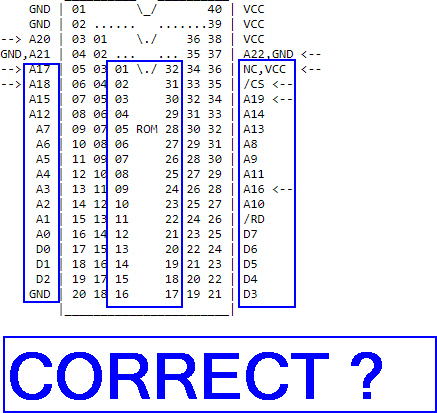 UV EPROM "E" is "CE" or "CS" in other IC naming, and "G" is "OE" or "RD"
3) What is the right Pinout About the Maskrom of MMX2 ? Is this One Correct ? I think that copy of Nocash's pinout is correct, but you can cross-check against his pinout of the CX4. But yes, that's basically the correct instructions. Ok thanks, since i know the pinout is correct, please can you tell me how i connect the 27C160 to the 2 MaskRom (i will withdraw them). But can you tell me how to connect each other ? 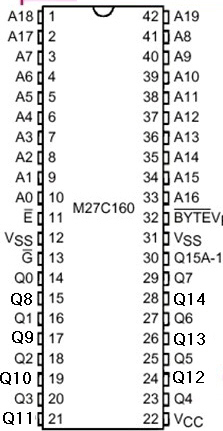 The 27C160 is a 16-bit ROM; its address lines specify an address in 16-bit words. The CX4 wants to talk to an 8-bit ROM. thanks, here is my scheme, do you think its a good one ? A friend of mine told me to just put together the #26 and #27 of the CX4. Do you think its better if i use 2 x 27C801 ? No. I said that you had to connect CX4 A12 to 27C160 A11, and so on. Do not short them together. If that even works, it could damage the CX4 and eventually stop working. Well, it makes the rewiring instructions simpler, but I think I've heard they're much more expensive. Sounds difficult BUT, i need to find differents way to go ! So, what do you think about this one, if i want to make a MMX2/3 with a MMX3 PCB. I got 2 x 27C801, how can i do so to make a MM2 with a MMX2 PCB ? First thing first: That's fine for putting MMX3 on an MMX3 board. However. In the data programmed to the ROM is a command that controls whether the game addresses one ROM or two ROMs. So I think you'll have difficulty if you program MMX2 in and just place that on an MMX3 board. Just connect them, like-named pin to like-named pin. This case should be straightforward. MMX2 is 1.5MiB, so split it into the first 1 MiB and last 512 KiB; the first 1 MiB go onto the "U1" footprint and the last 512 KiB go onto the "U2" footprint.